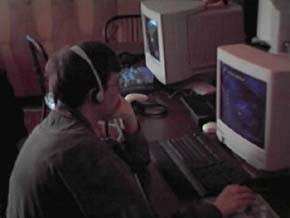 We attended Gamers LAN on February, 27th 1999. 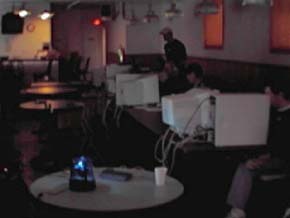 It is a monthly LAN Event at Dowling College in Oakdale, NY. 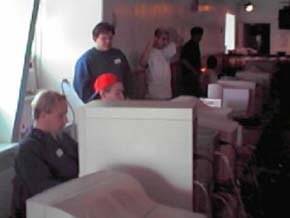 We had a great time and had some great Quake II and Halflife Deathmatch action as well as some SIN and CTF action. This was the 4th we attended but the pics for the last two did not come out too well. The next Gamers LAN is being planned, please contact Viper if your interested, you must sign up to attend. 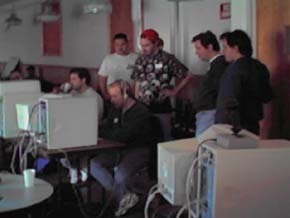 Rimmer in action at the Caveman table and some setting up of the room. 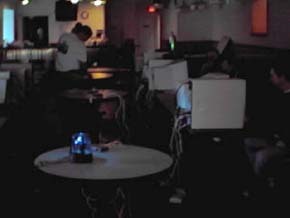 Some shots of both sides of the room with the action getting under way. 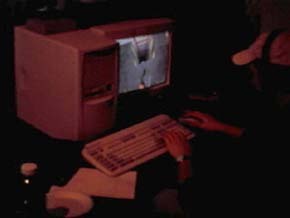 Some people gathering around what I think was a South Park game and a shot of one of the attendees playing Half-Life.